There is a loss of words in the face of tragedy, and for a period of time, those words may not appear the way the mind intends. 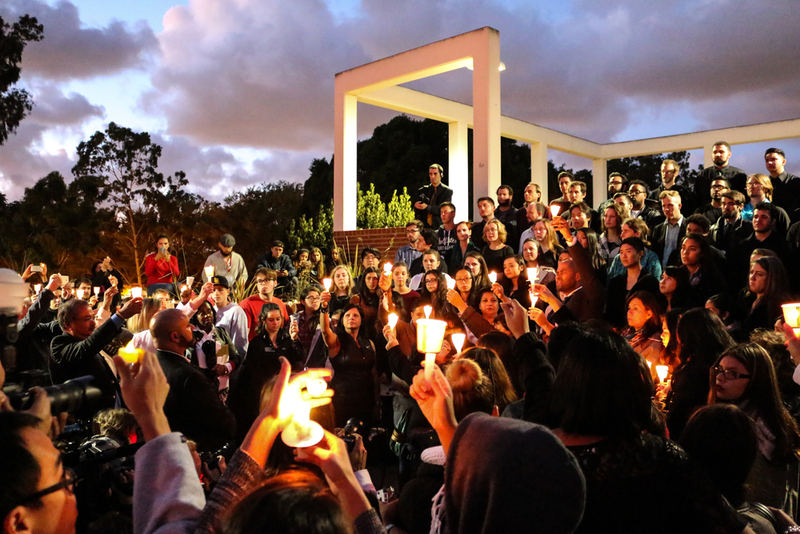 The University Student Union at California State University, Long Beach is filled with nothing but this same loss of words on Sunday, November 15. 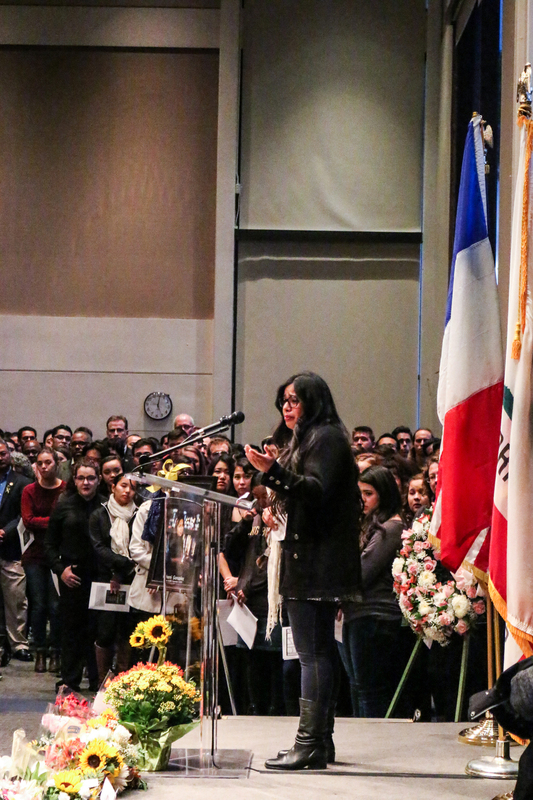 The room is filled with nothing but the sound of whispers and the sound of a solemn piano tune as students, family members, faculty, and others gather to confront a tragedy, to mourn a fallen sister, and to remember the ordinary instant in which the center did not hold and bodies of innocent lives had filled the streets of Paris. 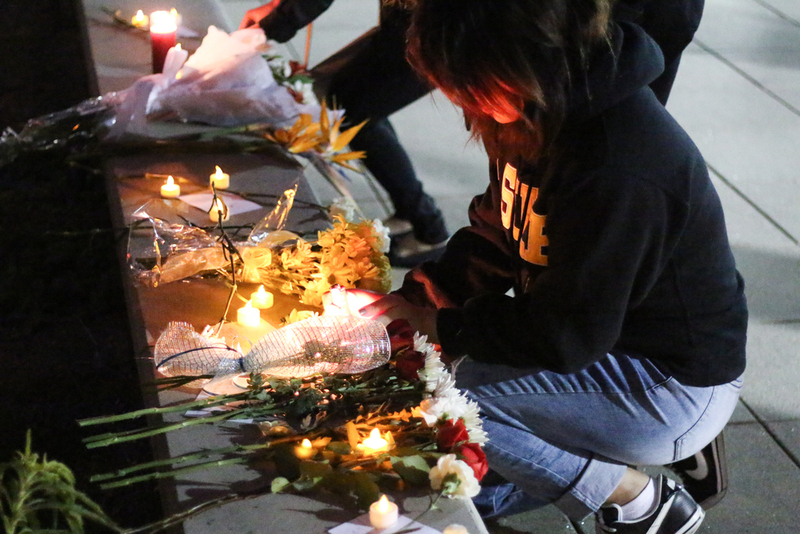 Just several months after the tragic shootings inside “Charlie Hebdo,” a French satirical newspaper, Paris found itself at the center of another tragedy on Friday, November 13, which proved fatal for more than a hundred people including 23-year-old CSULB student Nohemi Gonzalez. It was an ordinary night for Gonzalez, a design student fulfilling her dreams to study abroad in the City of Lights, as she sat at a Paris restaurant with friends, unaware of how fast a bullet could travel and how fast her innocence would turn into a tragedy. The piano tune begins to lower down as people continue to arrive, and a moment of almost silence drowns the room for a couple of seconds before a choir begins to sing. “What a great community,” a voice whispers in the back as she sees how more and more people pack the room, some who know Gonzalez personally and others who don’t. Within minutes, the choir stops. 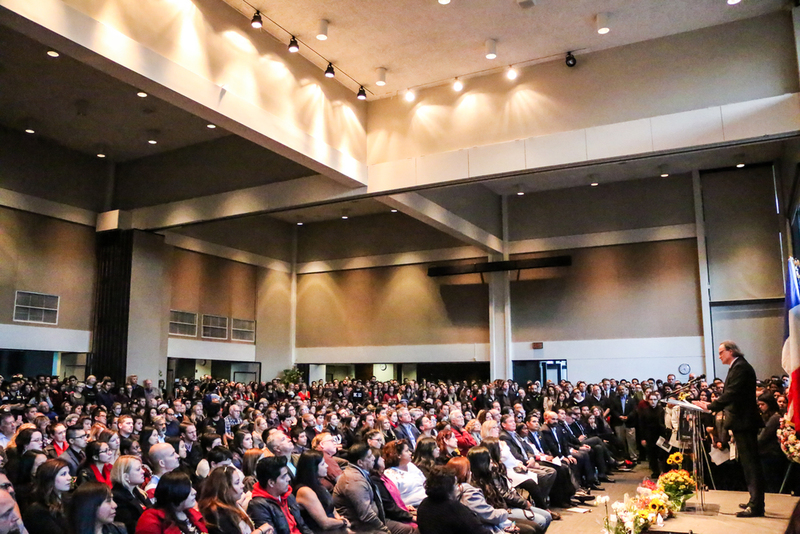 As officials like CSULB President Jane Close Conoley and CSU Chancellor Timothy White take the podium simultaneously, each finding words to comfort a grieving crowd, the words seem enough to momentarily sustain the pain that fill the air inside the room. But as words of hope and comfort start to sound repetitive, the words only become reminders of the far too painful moment where Gonzalez—a sister, a lover, a daughter, and a friend—had been taken away; the words become reminders of the potential Gonzalez had, of a voice being silenced, and of the multiple instances where simultaneous, coordinated terrorist attacks gave new meaning to life changing in an instant. “She viewed the world with trust,” he says. During this moment of recollection, Herman also recalls a series of quotes about Paris, about how Ernest Hemingway once called it “a moveable feast,” and how another writer once shrewdly observed that Paris attracts the people who aim to find their voices. The latter was true for Gonzalez, according to Herman. “She was on her way to defining and refining her voice as a designer,” he says. Voice. That’s what Gonzalez had, and she didn’t need to find it. 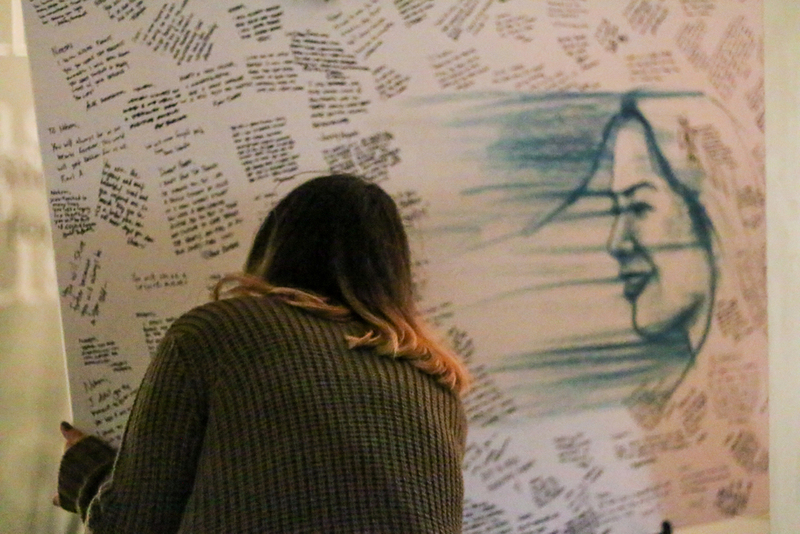 Whether it was the voice that led her to design and to create, or the voice that, according to Herman and fellow student Alex Schumacher, would “yell at you if you didn’t clean up your area,” Gonzalez led a life fueled by a voice that even when silenced by a bullet, could transcend and speak to hundreds, perhaps thousands of strangers. A voice that could speak to people from different backgrounds and generations, even if only for a moment long enough for them to remember the fragility of human nature. By the podium, there is one photograph of Gonzalez where she is beautifully staring into the camera, smiling as if she knew the person looking from the other side of the picture. In this photograph she is surrounded by different colored lights in the background, lights similar to the streets of Paris, and lights similar to the glow of the very candles that have been lit outside in her memory. It is a particularly cold night in California, miles away from the center of the tragedy, and the crowd gathers outside to a designated area for the candle ceremony. It is forecasted to rain tonight, but as the clouds move to a certain direction the rain is nowhere to be found and the air just feels warm. Perhaps it is because of the candles that each of us had in our hands, or perhaps we were just too numb to acknowledge the cold. But in that instant, what happened before or during the events in Paris felt relatively small compared to what happened after, to how different people have come together, even for just an hour, to connect and stand in solidarity. There’s no rain tonight, and the candle lights continue to glow. 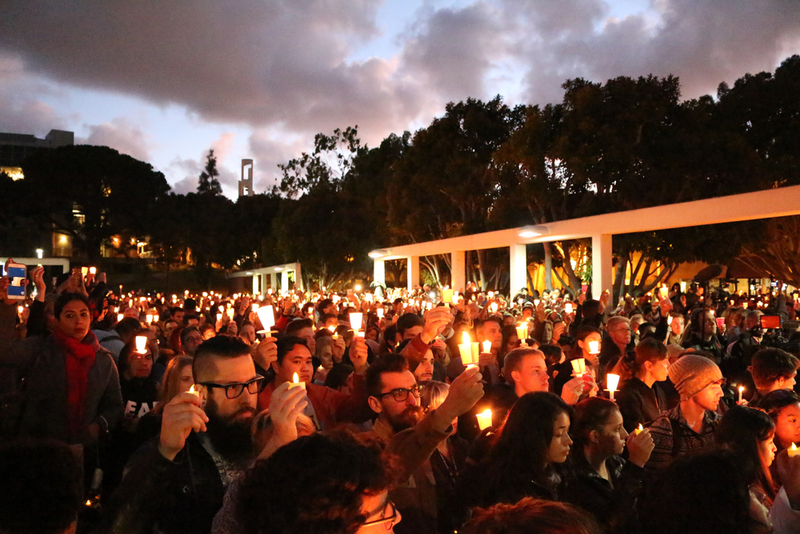 For a moment, it seems that Gonzalez could be there, staring into the camera just as she did in the photograph, smiling at the hundreds of people who are each holding a candle for a voice they may never have heard. A voice they’ll only hear from other voices. A voice whose voice they would never hear again. A voice of one hundred and more. There is a loss of words, a loss of voice, in the face of tragedy. But given time, those words and those voices find themselves again. It is a difficult idea to see, and an even more difficult idea to hang on to in the difficult days ahead.